"Will be taking a global perspective. She will touch on progress made since she was last here and challenges that remain." For a woman who says she is not head of any country-only titular head of state of 16 countries including Australia, Canada and New Zealand and the nominal representative of 54 governments in the British Commonwealth, who is fooling who? Why should be the people of the world listen to a little old lady from Britain? The answer is because her hereditary demands it. The visit by the queen, which was billed as low key-a five hour visit-was designed to get the global agenda of sustainable development and climate control back on track and to make a statement. Nothing the queen does is low key as every visit, and every word has a meaning and a goal for total control. First let's take a look at the queen herself. According to Who Owns the World by Kevin Cahill, the queen is the legal owner of 6,600 million acres of land that equals one sixth of the earth's non-ocean surface. She is the only person on earth who owns whole countries and who owns countries that refer not her own domestic territory. This land ownership is separate from her role as head of state and is different from other monarchies - like Norway, Belgium, and Denmark, where no such claim is made. The value of her holdings is approximately $33T, more than the estimated value of all of the earth's natural resources which is estimated to be $25T. Secondly, the physical structure of the United Nations and its agenda represents the completion of the dream and aspirations of British aristocrat Cecil Rhodes to return the United States and the rest of the world back under British rule. "too little of the globe was British territory and if we had retained America there would be millions more of English living." "the ultimate recovery of the United States of America as an integral part of the British Empire, the consolidation of the whole Empire, the inauguration of a system of colonial Representation in the Imperial Parliament which may tend to weld together the disjointed Members of the Empire," which may well ultimately be achieved, by the Roundtable which "publicized the idea of and the name 'British Commonwealth of Nations.'" The executors of Rhodes' six wills had concerns and fears about what kind of structure all of this should take. "a Commonwealth of Nations and then place that system within a League of Nations." The United Nations is the successor to the League of Nations and the Commonwealth is inside the U.N. In other words, we are there. The representatives to the UN should have greeted her, "Hail Caesar"! It should be noted that from 1946-1989 the British Empire gave "independence" to many of their former colonies. How they did this was to allow them to have their own parliament with representative government and their own prime minister. Lest you think they can do as they please, the queen has her own appointed representative called the Director-General that reports to her everything going on in the country and who reads her instructions after the prime minister provides his report at the opening of their parliament. As each country obtained independence, they also got a vote at the United Nations. Today the Commonwealth has the potential of 54 votes to America's one vote. You will find if you look at the number of Commonwealth countries that are members of the other UN agencies like the IMF, World Bank, World Health Organization, World Trade Organization, etc., the U.S. is outvoted. In three separate interviews with representatives from three Commonwealth nations in 2002, I was told by each of them who looked at me with fear and terror when I challenged them to leave the Commonwealth that they could not. Since I addressed you last, the Commonwealth, too, has grown vigorously To become a group of nations representing nearly two billion people. Last November, when I opened the Commonwealth Heads of Government Meeting in Trinidad and Tobago, I told the delegates that the Commonwealth had the opportunity to lead. Today I offer you the same message. 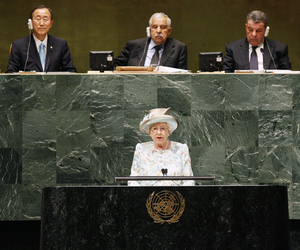 Queen Elizabeth II addresses the UN General Assembly for the second time in her career. and Muhammad Shaaban, Under-Secretary-General for General Assembly Affairs and Conference Management. Do you now see the meaning of the words and how she used words? The queen also made mention to the Millennium Development Goals. The bottom line, these wonderful socialistic humanitarian goals where the rich countries of the world will give a primary education to every child in the world, reduce poverty and starvation, HIV/Aids, and give $50 to every slum dweller to improve their lives will cost rich between $40-$60B a year according to the United Nations. This money is to come from an assessment on every country's Gross Domestic Product called "ODA" to the tune of .07%. In fact, you could call it a global tax. For as long as I have been covering global meetings, this has been a request by the United Nations, wow it is a request by the queen. Does anyone know who will get these monies? No. Cameroon, Gambia, Ghana, Guyana, Malawi, Mozambique, Somalia, Sierra Leone, Uganda and Zambia. Do you see what I see? The civilized word is "transfer of wealth." That brings us to the environment, Agenda 21, sustainable development, and climate change. While the first pre-United Nations Conference on population was held in 1927 with the assistance of the League of Nations, it was not until 1972 that the United Nations held its own environmental conference in Stockholm. Eleven years before in 1961, Prince Philip the queen's husband and Prince Bernhard of the Netherlands started the World Wildlife Fund, considered one of the oldest and largest environmental groups in the world. World Wildlife Fund is responsible for the publication of many studies and reports on how to save the environment. These documents have been used to support and implement Agenda 21. In 1972 the Club of Rome published Limits to Growth which said the world could not sustain the population and that something would have to be done. Since the dictates of Agenda 21 are based on Limits to Growth assumptions, in a 2006 interview with Maurice Strong who chaired the 1972 and 1992 earth summits, I asked him if in looking back the assumptions and computer models that were used for that report were wrong, given today's data, and he admitted that they should be revised. The bottom line is that most of the environmentalism and ideas for environmentalism are being birthed in England. It was a British scientist, James Lovelock, who formulated the "Gaia Hypothesis" that the earth is a living organism and that it must be protected from you and me. Prince Charles has been involved in environmentalism since 1970 and is responsible for helping to get Agenda 21 to be approved by 25,000 conference participants and delegates at the 1992 UNCED conference through his Prince of Wales International Business Leaders Forum. When you study Agenda 21, it basically is a return of the earth to feudalism. The idea being that you and I cannot protect the earth's resources so the United Nation's has to do it moves the $25T value of earth's natural resources into the balance sheets of the QUEEN. The cost to implement climate change is estimated to be between $80-$100B a year. British Petroleum (BP) which is largely owned by the queen could make up their current oil spill expenses very quickly if the U.S. government is stupid enough to pass "cap and trade." "Does the Queen of Canada" become the "Queen of America" through the North American Free Trade Agreement? It appears to be so according to my research. Although Cecil Rhodes talked about "world peace", I believe what the queen is talking about is the WHOLE PIECE. The operation we are discussing here has been 133 years in operation with many actors contributing to its establishment. They include many British and American industrialists and bankers such as the Rockefeller's, Vanderbilt's, the Whitney's, the Morgan's and Schiff's. the Council on Foreign Relations, it includes the International Chamber of Commerce, the World Economic Forum, and many other global organizations and NGO's. For those who still don't understand what happened at the United Nations on July 6, 2010 is that the conquering ruler of the world came and delivered a sharp admonition to the representatives that it is time to act. In my lifetime, the United Nations has moved from being a high-minded aspiration to being a real force the common good. In tomorrow's world, we must all work together as hard as ever if we are truly to be United Nations. Do you want to be the United Nations or do you want to be the United States of America? She is the only person on earth who owns whole countries, and who owns countries that are not her own domestic territory. This land ownership is separate from her role as head of state and is different from other monarchies where no such claim is made - Norway, Belgium, Denmark etc. This makes her the richest individual on earth. However, there is no way easily to value her real estate. There is no current market in the land of entire countries. At a rough estimate of $5,000 an acre, and based on the sale of Alaska to the USA by the Tsar, and of Louisiana to the USA by France, the Queen’s land holding is worth a notional $33,000,000,000,000 (Thirty three trillion dollars or about £17,600,000,000,000). Her holding is based on the laws of the countries she owns and her land title is valid in all the countries she owns. 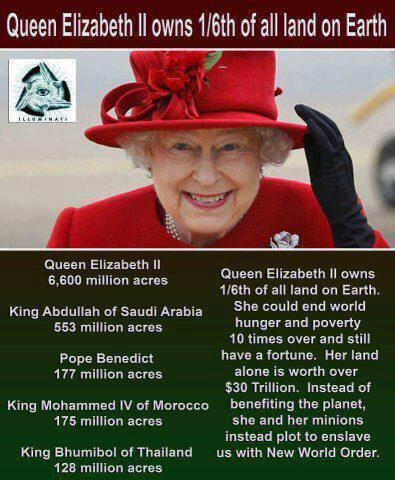 She is the world’s largest landowner by a significant margin. The next largest landowner is the Russian state, with an overall ownership of 4,219 million acres, and a direct ownership comparable with the Queen’s land holding of 2,447 million acres. The 3rd largest landowner is the Chinese state, which claims all of Chinese land, about 2,365 million acres. The 4th largest landowner on earth is the Federal Government of the United States, which owns about one third of the land of the USA, 760 million acres.